Please arrive at your scheduled time. 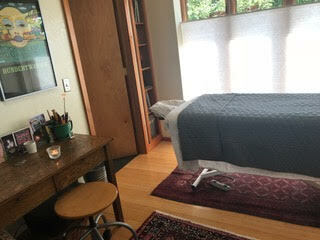 Your appointment includes time for any necessary consultation and/or paperwork as well as the full scheduled massage. After knocking, I will greet you at my door and invite you in. We will talk about how you’re feeling and what you would like to address during our time together. I will give you some pointers about sharing what you’re experiencing in our work, using your breath and becoming mindful of your inner experience. I want you to get the most from your bodywork experience. Good communication can improve your massage experience. Your comfort is important! Proper draping is important to me. And you can choose to leave garments on if you wish throughout the session. My home is clean and quiet and pet-free. I may check in with you about using essential oils or muscle balm in your treatment. I also use relaxing lighting and music to enhance the experience which can be adjusted to your preferred level. I have an electric table that raises and lowers for easier access and I also have a table warmer available.